. 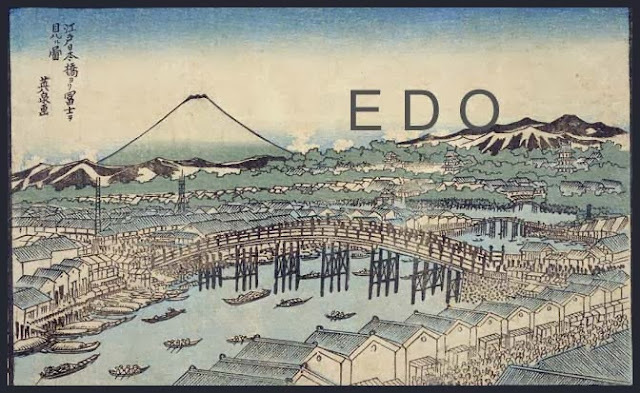 Edo shokunin　江戸の職人 Craftsmen of Edo .
. Geta 下駄 Wooden Sandals, Clogs . Often worn by Tengu 天狗. 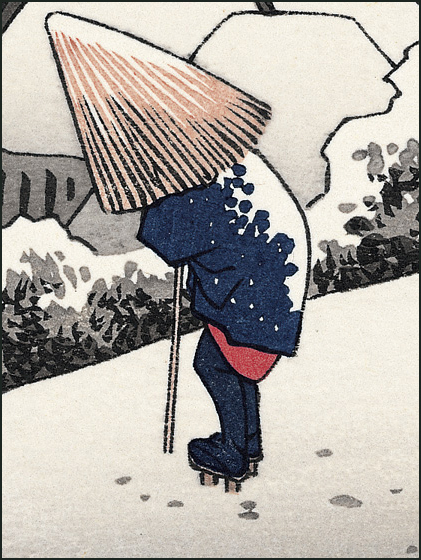 Geta (下駄) are a form of traditional Chinese-Japanese footwear that resemble both clogs and flip-flops. 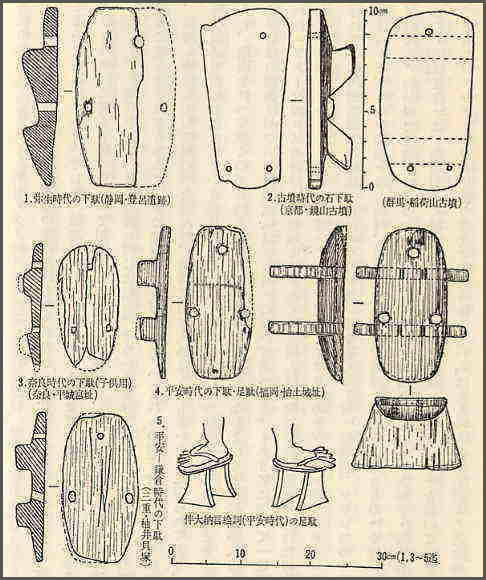 Geta were invented by the Chinese and then introduced to Japan from China. They are a kind of sandal with an elevated wooden base held onto the foot with a fabric thong to keep the foot well above the ground. . . . . . 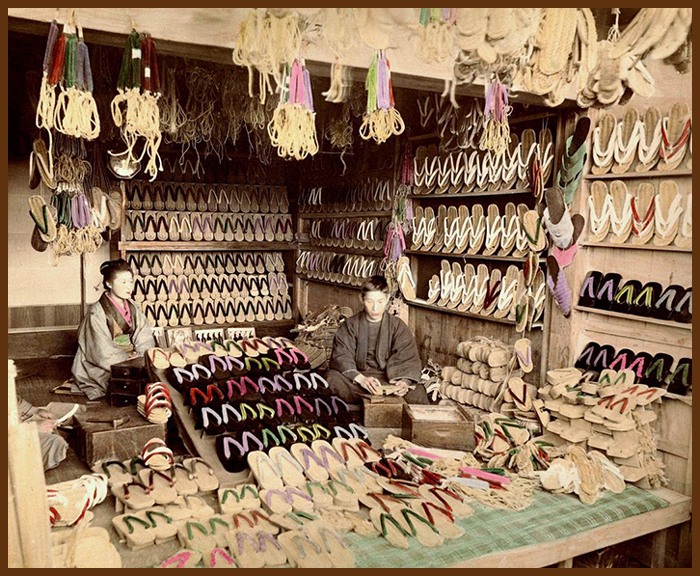 According to Japanese superstition, breaking the thong on one's geta is considered very unlucky. Look at the toes holding these high Geta! 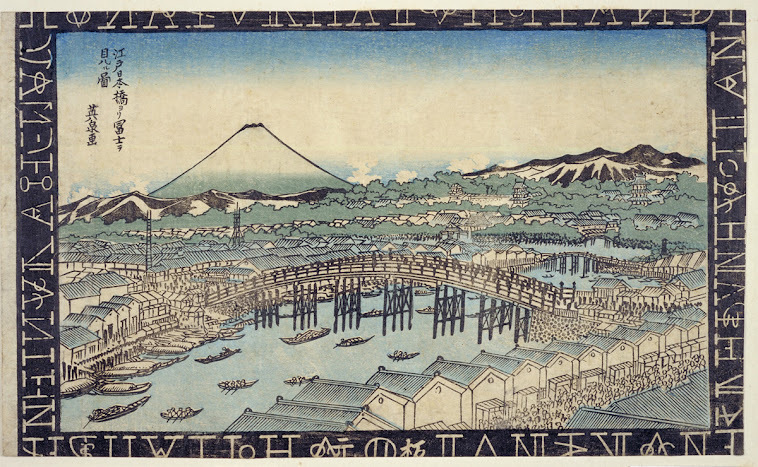 下駄　浮世絵 Geta with Ukiyo-E patterns are also popular ! Click on the photo for more samples ! 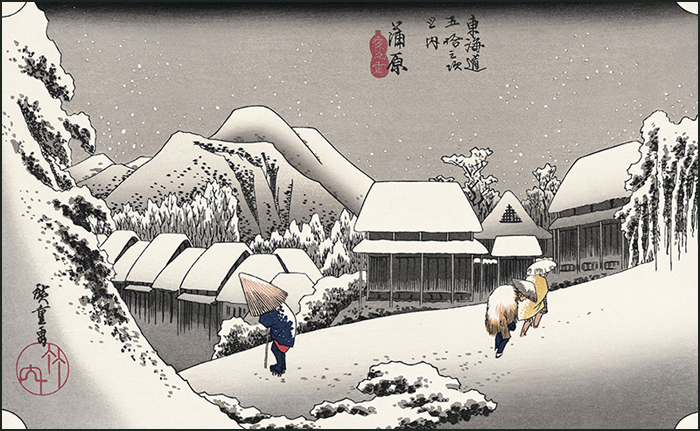 Since the middle of the Edo period, Geta had made their way into the city not only as an item of every-day use but also an item of fashion. 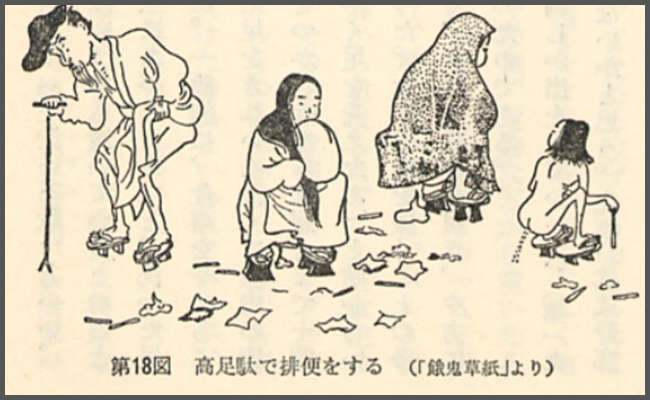 The much cheaper straw sandals were used for every-day walking, especially by the 長屋　Nagaya population living in cheap quarters. A craftsman is just about to put a whole into the wood for the Hanao. First the hole is made with a drill, and the wood standing up is then burned down with metal chopsticks that can be heated in fire. komageta 駒下駄 Komageta, the wooden parts are made of one piece. 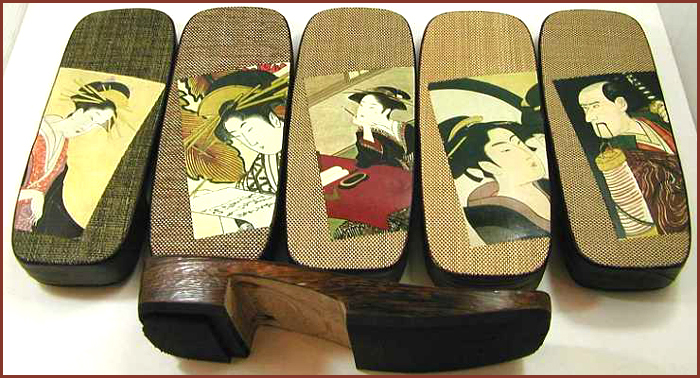 Geta are made of one piece of solid wood forming the sole and two wooden blocks underneath. These blocks may have a metal plate on the section that touches the ground in order to lengthen the life span of the Geta. A V-shaped thong of cloth forms the upper part of the sandal. may vary in shape: oval ("more feminine") to rectangular ("more masculine") and color (natural, lacquered, or stained). 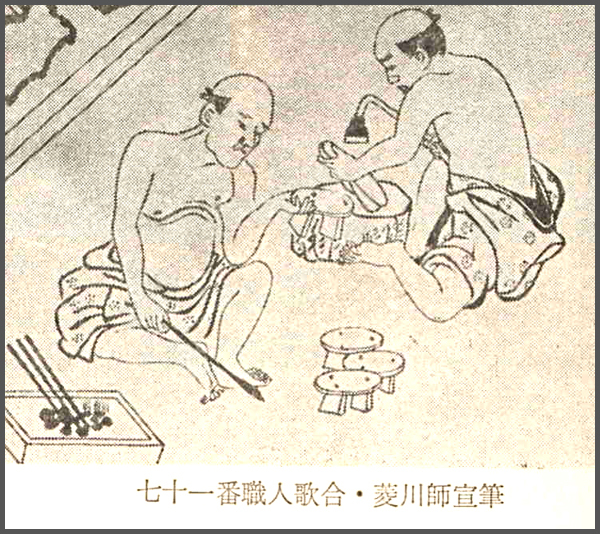 The ha (歯, teeth) may also vary in style; for example, tengu-geta have only a single centered "tooth". There are also less common geta with three teeth. 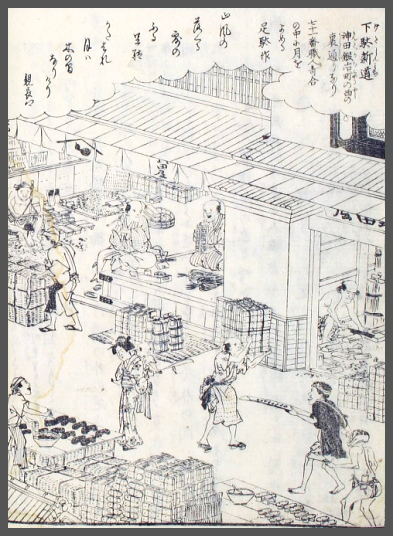 Merchants use(d) very high geta (two long teeth) to keep the feet well above the seafood scraps on the floor. 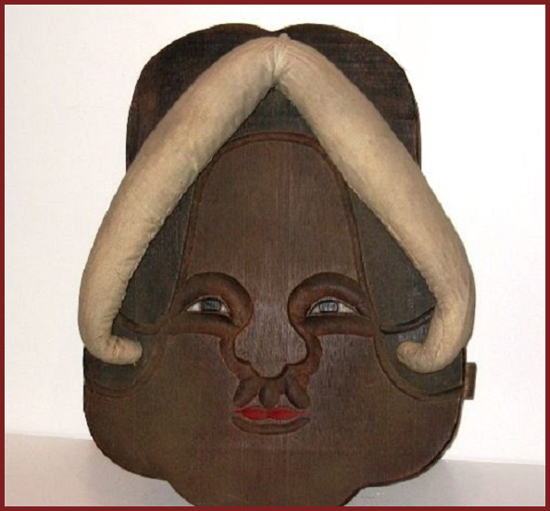 The teeth are usually not separate, instead, the geta is carved from one block of wood. The tengu tooth is, however, strengthened by a special attachment. The teeth of any geta may have harder wood drilled into the bottom to avoid splitting, and the soles of the teeth may have rubber soles glued onto them. can be wide and padded, or narrow and hard, and it can be made with many sorts of fabric. Printed cotton with traditional Japanese motifs is popular, but there are also geta with vinyl and leather hanao. Inside the hanao is a cord (recently synthetic, but traditionally hemp) that is knotted in a special way to the three holes of the dai. In the wide hanao there is some padding as well. The hanao are replaceable. 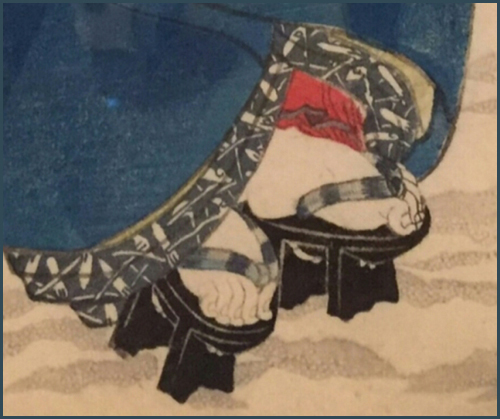 It sits between the two first toes because having the thong of rectangular geta anywhere but the middle would result in the inner back corners of the geta colliding when walking. One partner is at the entrance hall and all ready to leave the home now in anger . . . but well, the good couple comes back to its sense and all is well again. 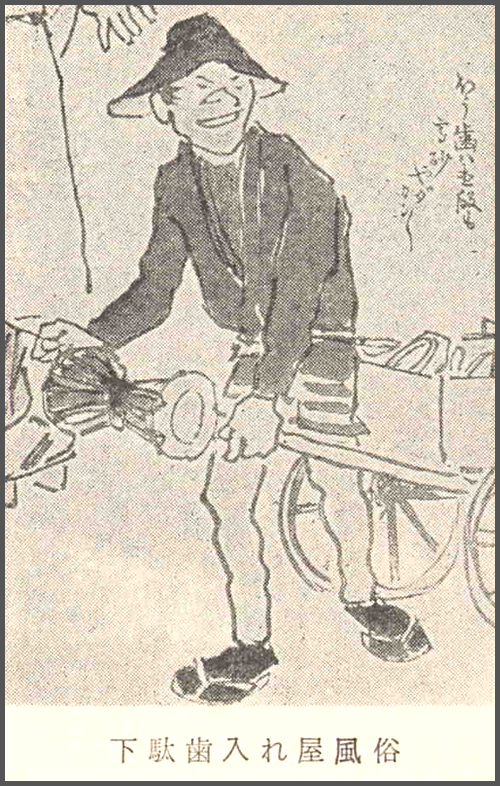 This was a job for a repairman walking along the streets of Edo. In the early Meiji period the region of 自由ヶ丘公園 Jiyugaoka Park was still a quiet Pine grove. The decided to build a 寺子屋 Terakoya school there. During the construction someone threw an old pair of geta in the fundament without much thought. Eventually the building was finished, but every night there was the sound of wooden Geta walking around and a hig-pitched whailing and crying: "This heavy stone is hurting by broken back!" When they opened the fundament to have a look, they found the pair of Geta and took it out. Now all was quiet. 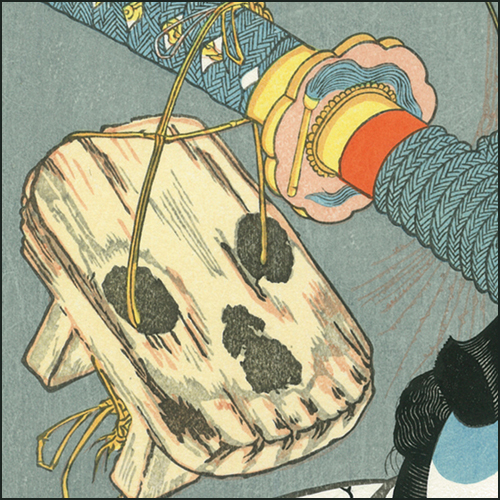 Gosuke wears a robe with a skull pattern. 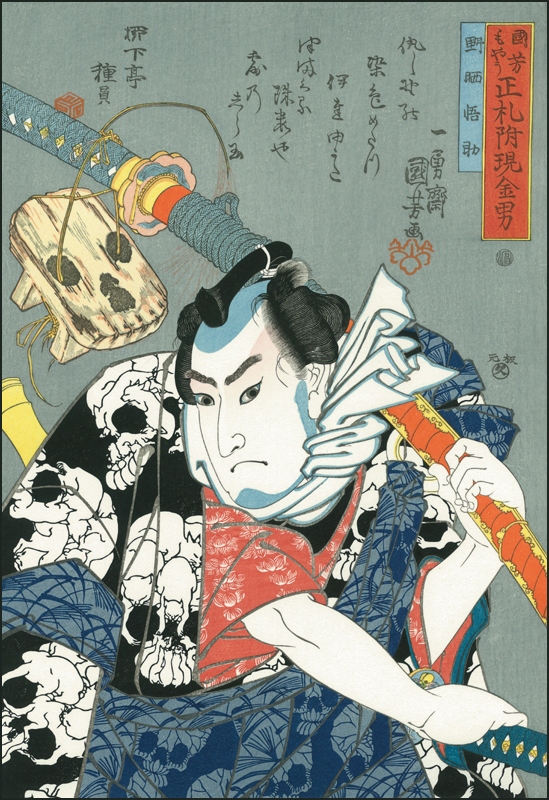 From the sword on his back hangs a Geta with marks in the form of a skull too. He is the henchman for the robber chief 日本駄右衛門 Nippon Daemon. 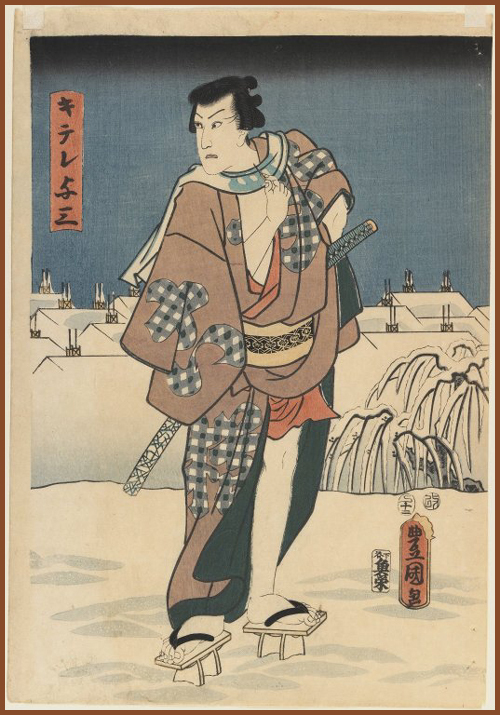 He is known as a street knight (otokodate). They lived by a strict code of honor which dictated that they always have to assist people in need. 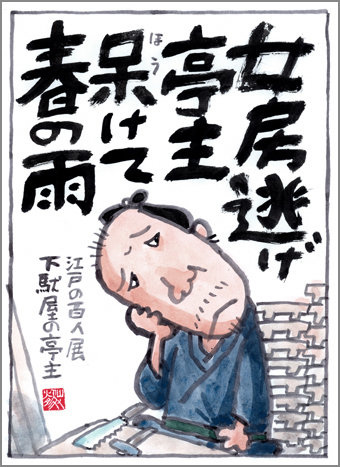 It is also the theme of a popular kabuki play. At the Tengu-Iwa there are imprints of the geta 下駄 wooden clogs of the Tengu and the hooves of his horse. Once at New Year an old lady living nearby heard the sound of drums and festival bells and became so afraid, she shut all the doors and windows of her home.